The Know Your Family Meal Plan! You are here: Home / Finance / Meal Planning / The Know Your Family Meal Plan! My friend Kelly, from Redefined Mom, has written this great piece on Meal Planning! Thanks, Kelly!! Do you meal plan? In the beginning, I created weekly meal plans. I would base my meals off what was on sale that week. This worked great as long as I only bought what was on sale. My problem – I picked recipes that called for three things on sale and five things that weren’t. In an effort to get our grocery budget even lower, I looked into monthly meal planning. But honestly, the more I read, the more intimidated I felt. These crafty-meal-planning women were more organized, creative and disciplined than I could ever be. They used charts like the picture above and I liked scrap paper. I also knew “me” and “me” has a tendency to say “I don’t feel like that tonight” or “I’m going to channel my inner-Julia Child tonight” regardless of what a laminated board with the title “Meal Plan” says. So, I made my own system – the “Know thy Family” meal plan. 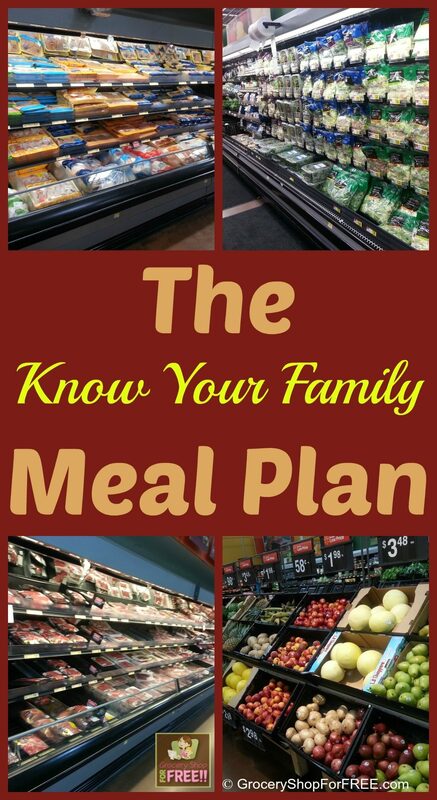 The Know Your Family Meal Plan – a monthly meal plan that incorporates Knowing What Your Family Will Eat and Incorporating Cheap Fillers from items in the stockpile while allowing flexibility and staying within budget and isn’t written on anything laminated. Step 3: Evaluate your pantry, stockpile and freezer. Write major ingredients down. Pick recipes from items you have on hand and place them in your “family” slots. Got a hodgepodge of stuff – go to allrecipes.com and type in ingredients and see what recipe comes up. Note: It’s okay to need one or two things to complete a recipe – but not five or six. The goal is to shop from your stockpile – the place where you bought everything at rock-bottom prices. Step 4: Make a shopping list of ingredients you need to purchase. Watch circular/sales/etc. for these items and buy on sale (and with coupon) if possible. Step 6: Feel free to interchange different recipes for different days. Kids favorite is pancakes and eggs on Week 3 – but you’ve had a busy week and want to move it to Week 2 – do it. Want to cook like a banshee for five days and take the last two off – do it. Step 7: Discipline yourself to only buy “rock-bottom” priced items for the rest of the month because you don’t “need” to buy anything. Remember, you have a meal plan in place – enjoy the peace of mind and less hectic 5:00 scramble because of your plan. This is only one of MANY monthly meal plan styles and you need to create one that works for you. Bottom line: Creating a meal plan is as personal as creating a coupon organizing system – you need to do what works for you. But in order to really save, you need to do it. Kelly Snyder is the author of Redefined Mom – Kelly is a self defined grown-up mom. She discusses style, beauty, home, life, travel and food (how she gets a great deal on all of it) while laughing and embracing this next season in her family’s lives. What about you? What kind of meal plan works for you? 7-days, 2-weeks, a month? Do you have a cool online tool that you use? Share with us – we’d love to know.